In much of contemporary experimental writing, there is a tendency to valorize fragmented approaches to the lyric, to praise the disintegration of voice. This approach is filled with risks, among them a troubling lack of clarity in the terms of address. More often than not, the intimacy that is at stake between characters in a poem, the inevitably intriguing relationship between the “I” and the “you,” remains poorly articulated. We are left with the mere promise of plot, a gesture toward persona and voice, the luminous fragments of so many plausible narratives. 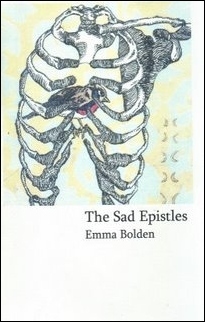 With that said, Emma Bolden’s The Sad Epistles and Megan Kaminski’s Desiring Map are rare exceptions to this disconcerting trend in recent poetry. These writers offer innovative variations on traditional lyric address that are as carefully considered as they are contemplative, reminding us that the precision with which the “you” is defined does not foreclose artistic or imaginative possibility. Though presenting us with clearly delineated rhetorical situations, a multiplicity is still housed within each seemingly simple manifestation of the love object. This expertly orchestrated complexity is brought to bear on incisive discussions of love, loss, and longing. In each of these finely crafted collections, the “you” becomes an accumulation—of memories, of dreams, of experiences—and each utterance of the unadorned pronoun gestures toward the very impossibility of signification. Bolden and Kaminski engage a rich tradition of lyric address while at the same time interrogating it, each poem a reflection on the philosophical problems inherent in its own making. Throughout The Sad Epistles, Bolden’s language orbits around an alluringly absent center. “I’m flayed, a waiting,” she explains. The “you” is known to the reader only through the speaker’s desire, a longing housed within every darkened “hallway,” the room she inhabits “hung” with “ghosts.” Presented as a series of epistolary fragments that document a long-distance relationship, the poems in this chapbook offer a syntax shattered by an unfulfilled wish. “People are liars. // Petals are fingernails. // I am liar for saying so,” Bolden writes. These rhythmically obstructive pauses, and the declarative structure of every sentence, convey the power that the love object wields over the speaker. Stammering and uncertain, she is rendered nearly speechless in his absence. Your jaw is an opening I like too much, the back of you heel one I sing to. If I were an egg I’d peel myself. Bolden unequivocally asserts the difficulty of constructing a narrative edifice around loss. Indeed, “To talk” is always “the most difficult”. Lyric fragments become a metaphor for the speaker’s inability to make meaning from a “scalpel,” an “egg,” the outline of a beloved “jaw.” The sentences themselves often remain unpunctuated, visibly incomplete, and phrased in the conditional. We see that definitive assertion has become yet another impossibility. As Bolden skillfully articulates “an absence, a world,” the intervening presence that would provide unity, cohesion, and stability never once appears. Throughout this collection, lyric address is provocatively emptied of narrative. The end result is more real, and more true, than a story ever could be. Rather than recounting to the love object those things that he would more than likely remember (“a strong tooth’s gash,” “florid school portrait smiles”), he is shown, piece by piece, how he has unmade the world. 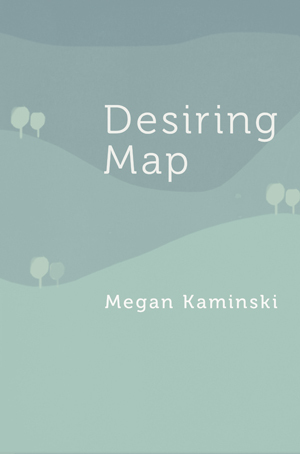 Megan Kaminski’s Desiring Map offers a “you” that is an accumulation of “river,” “cloud,” and “grass.” Yet the “clumps of hills” and “streaming / fields” rarely offer a glimpse of what is already familiar to the love object. Kaminski shows us that to convey desire in language is to create an intricately imagined landscape. The speaker’s longing takes shape as a “soft drift” across “the country,” “whisps of cold breath” exhaled by someone three cities away. Line by line, she attempts to show the love object a vast expanse, the “rooftops and horizons,” he has opened up within her psyche. As the book unfolds, love is revealed as a seemingly endless topography, rich with sound, echo, and music. Much like Bolden’s artful fragmentation, Kaminski’s beautiful sonic flourishes read as an extension of content. The music of the poems offers a compelling metaphor for the sublime qualities of the “you.” Additionally, Kaminski’s mellifluous cadences read as an invitation, a beckoning to the “you” across a widening expanse. “Who can rattle off five addictives / let darkness creep from south,” Kaminski writes. Through song, the speaker implores. The assonance in these particular lines (consider the “a” in “can,” “rattle,” “addictives,” the “o” in “off” and “Who”) also calls our attention to language as an embodied experience. If spoken aloud, the words become almost tangible, a “ginger gin fizz” in one’s mouth. With that in mind, Kaminski draws a clear parallel between language and desire. She calls our attention to the ways that longing, like language, is a bodily experience, a starting ache. Lyric address and its ensuing music becomes a way of traversing distance, closing the gap between self and other, bringing a distant and inaccessible “you” into closer proximity. Here the “you” is asked to imagine the light, fragrance, and memory that permeate the speaker’s surroundings. This intricately imagined landscape, like many others in the book, becomes a kind of shared consciousness, a point of continuity between the always distant “I” and “you,” a luminous fiction into which the reader, too, is invited. Kristina Marie Darling is the author of over twenty books of poetry, most recently DARK HORSE (C&R Press, 2017). Her awards include two Yaddo residencies, a Hawthornden Castle Fellowship, and multiple residencies at the American Academy in Rome, as well as grants from the Whiting Foundation and Harvard University’s Kittredge Fund. Her poems and essays appear in The Gettysburg Review, Agni, New American Writing, The Iowa Review, The Los Angeles Review of Books, The Mid-American Review, and elsewhere. Her work has also been featured on the Poetry Foundation’s Harriet blog and the Academy of American Poets’ website, Poets.org. She is Editor-in-Chief of Tupelo Quarterly and Grants Specialist at Black Ocean.